A new ten-week Practice Session is being offered on Thursdays in Pottstown only. Students from all Swing Kat locations who have previously taken ‘20s Charleston are encouraged to attend this session. An instructor and several advanced students will be on hand to help attendees work out their specific trouble spots and practice the many steps covered in the Charleston class. Faryl Codispoti and Swing Kat Entertainment have offered swing dance classes for over 10 years. Swing Kat’s main location, The Ballroom on High in Pottstown, is the site for twice-monthly dances featuring live bands. The next dance with a live band is Saturday, March 18th, when Anna Cecilia and the Big Time will take the stage to present swingin’ tunes and soulful blues for the crowd. A beginner lesson will be taught starting at 7 p.m. and the band takes the stage at 8 p.m. Admission is $15 ($10 for students with ID), payable at the door. Most Fridays, Swing Kat holds DJ dances either in Pottstown or at the Lansdale location. A beginner lesson is taught at 7:30 p.m. and dancing begins at 8 p.m. Admission is $12 ($7 for students with ID). The Stompin’ Swing Out at Club 212 in Phoenixville is held the third Wednesday of the month. Admission is just $5 for this weeknight DJ event. 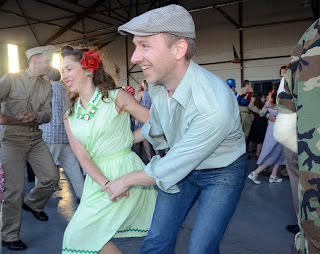 Check out the calendar at swingkat.com for details on all Swing Kat dances.